For other uses, see Cardiac arrest (disambiguation). CPR being administered during a simulation of cardiac arrest. Cardiac arrest is a sudden loss of blood flow resulting from the failure of the heart to effectively pump. Symptoms include loss of consciousness and abnormal or absent breathing. Some individuals may experience chest pain, shortness of breath, or nausea before cardiac arrest. If not treated within minutes, it typically leads to death. The most common cause of cardiac arrest is coronary artery disease. Less common causes include major blood loss, lack of oxygen, very low potassium, heart failure, and intense physical exercise. A number of inherited disorders may also increase the risk including long QT syndrome. The initial heart rhythm is most often ventricular fibrillation. The diagnosis is confirmed by finding no pulse. While a cardiac arrest may be caused by heart attack or heart failure, these are not the same. Prevention includes not smoking, physical activity, and maintaining a healthy weight. Treatment for cardiac arrest includes immediate cardiopulmonary resuscitation (CPR) and, if a shockable rhythm is present, defibrillation. Among those who survive, targeted temperature management may improve outcomes. An implantable cardiac defibrillator may be placed to reduce the chance of death from recurrence. In the United States, cardiac arrest outside hospital occurs in about 13 per 10,000 people per year (326,000 cases). In hospital cardiac arrest occurs in an additional 209,000. Cardiac arrest becomes more common with age. It affects males more often than females. The percentage of people who survive with treatment is about 8%. Many who survive have significant disability. However, many American television programs have portrayed unrealistically high survival rates of 67%. Cardiac arrest is preceded by no warning symptoms in approximately 50 percent of people. For those who do experience symptoms, they will be non-specific, such as new or worsening chest pain, fatigue, blackouts, dizziness, shortness of breath, weakness and vomiting. When cardiac arrest occurs, the most obvious sign of its occurrence will be the lack of a palpable pulse in the victim. Also, as a result of loss of cerebral perfusion (blood flow to the brain), the victim will rapidly lose consciousness and will stop breathing. The main criterion for diagnosing a cardiac arrest, as opposed to respiratory arrest, which shares many of the same features, is lack of circulation; however, there are a number of ways of determining this. Near-death experiences are reported by 10 to –20 percent of people who survived cardiac arrest. Certain types of prompt intervention can often reverse a cardiac arrest, but without such intervention, death is all but certain. In certain cases, cardiac arrest is an anticipated outcome of a serious illness where death is expected. Sudden cardiac arrest (SCA) and sudden cardiac death (SCD) occur when the heart abruptly begins to beat in an abnormal or irregular rhythm (arrhythmia). Without organized electrical activity in the heart muscle, there is no consistent contraction of the ventricles, which results in the heart's inability to generate an adequate cardiac output (forward pumping of blood from heart to rest of the body). There are many different types of arrhythmias, but the ones most frequently recorded in SCA and SCD are ventricular tachycardia (VT) or ventricular fibrillation (VF). Coronary artery disease (CAD), also known as ischemic heart disease, is responsible for 62 to 70 percent of all SCDs. CAD is a much less frequent cause of SCD in people under the age of 40. Cases have shown that the most common finding at postmortem examination of sudden cardiac death (SCD) is chronic high-grade stenosis of at least one segment of a major coronary artery, the arteries that supply the heart muscle with its blood supply. Structural heart disease not related to CAD (i.e. hypertrophic cardiomyopathy, congenital coronary artery anomalies, myocarditis) account for 10% of all SCDs. Examples of these include: cardiomyopathy, cardiac rhythm disturbances, myocarditis, hypertensive heart disease, and congestive heart failure. Left ventricular hypertrophy is thought to be a leading cause of SCD in the adult population. This is most commonly the result of longstanding high blood pressure which has caused secondary damage to the wall of the main pumping chamber of the heart, the left ventricle. A 1999 review of SCDs in the United States found that this accounted for over 30% of SCDs for those under 30 years. A study of military recruits age 18-35 found that this accounted for over 40% of SCDs. Congestive heart failure increases the risk of SCD fivefold. Arrhythmias that are not due to structural heart disease account for 5 to 10% of sudden cardiac arrests. These are frequently caused by genetic disorders that lead to abnormal heart rhythms. The genetic mutations often affect specialised proteins known as ion channels that conduct electrically charged particles across the cell membrane, and this group of conditions are therefore often referred to as channelopathies. Examples of these inherited arrhythmia syndromes include Long QT syndrome, Brugada Syndrome, Catecholaminergic polymorphic ventricular tachycardia, and Short QT syndrome. Other conditions that promote arrhythmias but are not caused by genetic mutations include Wolff-Parkinson-White syndrome. Long QT syndrome, a condition often mentioned in young people's deaths, occurs in one of every 5000 to 7000 newborns and is estimated to be responsible for 3000 deaths each year compared to the approximately 300,000 cardiac arrests seen by emergency services. These conditions are a fraction of the overall deaths related to cardiac arrest, but represent conditions which may be detected prior to arrest and may be treatable. SCA due to non-cardiac causes accounts for the remaining 15 to 25%. The most common non-cardiac causes are trauma, bleeding (such as gastrointestinal bleeding, aortic rupture, or intracranial hemorrhage), overdose, drowning and pulmonary embolism. Cardiac arrest can also be caused by poisoning (for example, by the stings of certain jellyfish). "Hs and Ts" is the name for a mnemonic used to aid in remembering the possible treatable or reversible causes of cardiac arrest. Hyperkalemia or Hypokalemia – Both excess and inadequate potassium can be life-threatening. The risk factors for SCD are similar to those of coronary artery disease and include age, cigarette smoking, high blood pressure, high cholesterol, lack of physical exercise, obesity, diabetes, and family history. A prior episode of sudden cardiac arrest also increases the risk of future episodes. Current cigarette smokers with coronary artery disease were found to have a two to threefold increase in the risk of sudden death between ages 30 and 59. Furthermore, it was found that former smokers’ risk was closer to that of those who had never smoked. The mechanism of death in the majority of people dying sudden cardiac deaths is ventricular fibrillation. Structural changes in the diseased heart as a result of inherited factors (mutations in ion-channel coding genes for example) cannot explain the suddenness of SCD. Also, sudden cardiac death could be the consequence of electric-mechanical disjunction and bradyarrhythmias. Cardiac arrest is synonymous with clinical death. A cardiac arrest is usually diagnosed clinically by the absence of a pulse. In many cases lack of carotid pulse is the gold standard for diagnosing cardiac arrest, as lack of a pulse (particularly in the peripheral pulses) may result from other conditions (e.g. shock), or simply an error on the part of the rescuer. Nonetheless, studies have shown that rescuers often make a mistake when checking the carotid pulse in an emergency, whether they are healthcare professionals or lay persons. Owing to the inaccuracy in this method of diagnosis, some bodies such as the European Resuscitation Council (ERC) have de-emphasised its importance. 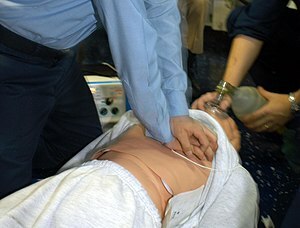 The Resuscitation Council (UK), in line with the ERC's recommendations and those of the American Heart Association, have suggested that the technique should be used only by healthcare professionals with specific training and expertise, and even then that it should be viewed in conjunction with other indicators such as agonal respiration. Various other methods for detecting circulation have been proposed. Guidelines following the 2000 International Liaison Committee on Resuscitation (ILCOR) recommendations were for rescuers to look for "signs of circulation", but not specifically the pulse. These signs included coughing, gasping, colour, twitching and movement. However, in face of evidence that these guidelines were ineffective, the current recommendation of ILCOR is that cardiac arrest should be diagnosed in all casualties who are unconscious and not breathing normally. Another method is to use molecular autopsy or postmortem molecular testing which uses a set of molecular techniques to find the ion channels that are cardiac defective. Clinicians classify cardiac arrest into "shockable" versus "non–shockable", as determined by the ECG rhythm. This refers to whether a particular class of cardiac dysrhythmia is treatable using defibrillation. 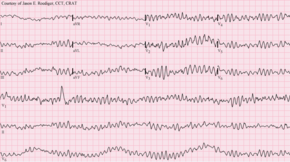 The two "shockable" rhythms are ventricular fibrillation and pulseless ventricular tachycardia while the two "non–shockable" rhythms are asystole and pulseless electrical activity. With positive outcomes following cardiac arrest unlikely, an effort has been spent in finding effective strategies to prevent cardiac arrest. With the prime causes of cardiac arrest being ischemic heart disease, efforts to promote a healthy diet, exercise, and smoking cessation are important. For people at risk of heart disease, measures such as blood pressure control, cholesterol lowering, and other medico-therapeutic interventions are used. A Cochrane review published in 2016 found moderate-quality evidence to show that blood pressure-lowering drugs do not appear to reduce sudden cardiac death. In medical parlance, cardiac arrest is referred to as a "code" or a "crash". This typically refers to "code blue" on the hospital emergency codes. A dramatic drop in vital sign measurements is referred to as "coding" or "crashing", though coding is usually used when it results in cardiac arrest, while crashing might not. Treatment for cardiac arrest is sometimes referred to as "calling a code". Crash teams (or code teams) – These are designated staff members with particular expertise in resuscitation who are called to the scene of all arrests within the hospital. This usually involves a specialized cart of equipment (including defibrillator) and drugs called a "crash cart" or "crash trolley". Medical emergency teams – These teams respond to all emergencies, with the aim of treating the people in the acute phase of their illness in order to prevent a cardiac arrest. These teams have been found to decrease the rates of in hospital cardiac arrest and improve survival. Critical care outreach – As well as providing the services of the other two types of team, these teams are also responsible for educating non-specialist staff. In addition, they help to facilitate transfers between intensive care/high dependency units and the general hospital wards. This is particularly important, as many studies have shown that a significant percentage of patients discharged from critical care environments quickly deteriorate and are re-admitted; the outreach team offers support to ward staff to prevent this from happening. An implantable cardioverter defibrillator (ICD) is a battery powered device that monitors electrical activity in the heart and when an arrhythmia or asystole is detected is able to deliver an electrical shock to terminate the abnormal rhythm. ICDs are used to prevent sudden cardiac death (SCD) in those that have survived a prior episode of sudden cardiac arrest (SCA) due to ventricular fibrillation or ventricular tachycardia (secondary prevention). ICDs are also used prophylactically to prevent sudden cardiac death in certain high risk patient populations (primary prevention). Numerous studies have been conducted on the use of ICDs for the secondary prevention of SCD. These studies have shown improved survival with ICDs compared to the use of anti-arrhythmic drugs. ICD therapy is associated with a 50% relative risk reduction in death caused by an arrhythmia and a 25% relative risk reduction in all cause mortality. Primary prevention of SCD with ICD therapy for high risk patient populations has similarly shown improved survival rates in a number of large studies. The high risk patient populations in these studies were defined as those with severe ischemic cardiomyopathy (determined by a reduced left ventricular ejection fraction (LVEF)). The LVEF criteria used in these trials ranged from less than or equal to 30% in MADIT-II to less than or equal to 40% in MUSTT. Marine-derived omega-3 polyunsaturated fatty acids (PUFAs) have been promoted for the prevention of sudden cardiac death due to their postulated ability to lower triglyceride levels, prevent arrhythmias, decrease platelet aggregation, and lower blood pressure. However, according to a recent systematic review, omega-3 PUFA supplementation are not being associated with a lower risk of sudden cardiac death. Sudden cardiac arrest may be treated via attempts at resuscitation. This is usually carried out based upon basic life support (BLS)/advanced cardiac life support (ACLS), pediatric advanced life support (PALS) or neonatal resuscitation program (NRP) guidelines. Cardiopulmonary resuscitation (CPR) is a key part of the management of cardiac arrest. It is recommended that it be started as soon as possible and interrupted as little as possible. The component of CPR that seems to make the greatest difference in most cases is the chest compressions. Correctly performed bystander CPR has been shown to increase survival; however, it is performed in less than 30% of out of hospital arrests as of 2007[update]. If high-quality CPR has not resulted in return of spontaneous circulation and the person's heart rhythm is in asystole, discontinuing CPR and pronouncing the person's death is reasonable after 20 minutes. Exceptions to this include those with hypothermia or who have drowned. Longer durations of CPR may be reasonable in those who have cardiac arrest while in hospital. Bystander CPR, by the lay public, before the arrival of EMS also improves outcomes. Either a bag valve mask or an advanced airway may be used to help with breathing. High levels of oxygen are generally given during CPR. Tracheal intubation has not been found to improve survival rates or neurological outcome in cardiac arrest and in the prehospital environment may worsen it. Endotracheal tube and supraglottic airways appear equally useful. When done by EMS 30 compressions followed by two breaths appear better than continuous chest compressions and breaths being given while compressions are ongoing. For bystanders, CPR which involves only chest compressions results in better outcomes as compared to standard CPR for those who have gone into cardiac arrest due to heart issues. Mechanical chest compressions (as performed by a machine) are no better than chest compressions performed by hand. It is unclear if a few minutes of CPR before defibrillation results in different outcomes than immediate defibrillation. If cardiac arrest occurs after 20 weeks of pregnancy someone should pull or push the uterus to the left during CPR. If a pulse has not returned by four minutes emergency Cesarean section is recommended. Defibrillation is indicated if a shockable rhythm is present. The two shockable rhythms are ventricular fibrillation and pulseless ventricular tachycardia. In children 2 to 4 J/Kg is recommended. In addition, there is increasing use of public access defibrillation. This involves placing an automated external defibrillator in public places, and training staff in these areas how to use them. This allows defibrillation to take place prior to the arrival of emergency services, and has been shown to lead to increased chances of survival. Some defibrillators even provide feedback on the quality of CPR compressions, encouraging the lay rescuer to press the person's chest hard enough to circulate blood. In addition, it has been shown that those who have arrests in remote locations have worse outcomes following cardiac arrest. As of 2016[update] medications, while included in guidelines, have not been shown to improve survival to hospital discharge following out-of-hospital cardiac arrest. This includes the use of epinephrine (adrenaline), atropine, lidocaine, and amiodarone. Epinephrine is generally recommended every five minutes. Vasopressin overall does not improve or worsen outcomes compared to epinephrine. The combination of epinephrine, vasopressin, and methylprednisolone appears to improve outcomes. Epinephrine does appear to improve short-term outcomes such as return of spontaneous circulation. Some of the lack of long-term benefit may be related to delays in epinephrine use. While evidence does not support its use in children, guidelines state its use is reasonable. Lidocaine and amiodarone are also deemed reasonable in children with cardiac arrest who have a shockable rhythm. The general use of sodium bicarbonate or calcium is not recommended. The 2010 guidelines from the American Heart Association no longer contain the recommendation for using atropine in pulseless electrical activity and asystole for want of evidence for its use. Neither lidocaine nor amiodarone, in those who continue in ventricular tachycardia or ventricular fibrillation despite defibrillation, improves survival to hospital discharge but both equally improve survival to hospital admission. Thrombolytics when used generally may cause harm but may be of benefit in those with a confirmed pulmonary embolism as the cause of arrest. Evidence for use of naloxone in those with cardiac arrest due to opioids is unclear but it may still be used. In those with cardiac arrest due to local anesthetic, lipid emulsion may be used. Cooling adults after cardiac arrest who have a return of spontaneous circulation (ROSC) but no return of consciousness improves outcomes. This procedure is called targeted temperature management (previously known as therapeutic hypothermia). People are typically cooled for a 24-hour period, with a target temperature of 32–36 °C (90–97 °F). There are a number of methods used to lower the body temperature, such as applying ice packs or cold-water circulating pads directly to the body, or infusing cold saline. This is followed by gradual rewarming over the next 12 to 24 hrs. Recent meta-analysis found that the use of therapeutic hypothermia after out-of-hospital cardiac arrest is associated with improved survival rates and better neurological outcomes. Some people choose to avoid aggressive measures at the end of life. A do not resuscitate order (DNR) in the form of an advance health care directive makes it clear that in the event of cardiac arrest, the person does not wish to receive cardiopulmonary resuscitation. Other directives may be made to stipulate the desire for intubation in the event of respiratory failure or, if comfort measures are all that are desired, by stipulating that healthcare providers should "allow natural death". Early recognition – If possible, recognition of illness before the person develops a cardiac arrest will allow the rescuer to prevent its occurrence. Early recognition that a cardiac arrest has occurred is key to survival – for every minute a patient stays in cardiac arrest, their chances of survival drop by roughly 10%. Early CPR – improves the flow of blood and of oxygen to vital organs, an essential component of treating a cardiac arrest. In particular, by keeping the brain supplied with oxygenated blood, chances of neurological damage are decreased. If one or more links in the chain are missing or delayed, then the chances of survival drop significantly. These protocols are often initiated by a code blue, which usually denotes impending or acute onset of cardiac arrest or respiratory failure, although in practice, code blue is often called in less life-threatening situations that require immediate attention from a physician. Resuscitation with extracorporeal membrane oxygenation devices has been attempted with better results for in-hospital cardiac arrest (29% survival) than out-of-hospital cardiac arrest (4% survival) in populations selected to benefit most. Cardiac catheterization in those who have survived an out-of-hospital cardiac arrest appears to improve outcomes although high quality evidence is lacking. It is recommended that it is done as soon as possible in those who have had a cardiac arrest with ST elevation due to underlying heart problems. The precordial thump may be considered in those with witnessed, monitored, unstable ventricular tachycardia (including pulseless VT) if a defibrillator is not immediately ready for use, but it should not delay CPR and shock delivery or be used in those with unwitnessed out of hospital arrest. The overall chance of survival among those who have cardiac arrest outside hospital is 10%. Among those who have an out-of-hospital cardiac arrest, 70% occur at home and their survival rate is 6%. For those who have an in-hospital cardiac arrest, the survival rate is estimated to be 24%. Among children rates of survival are 3 to 16% in North America. For in hospital cardiac arrest survival to discharge is around 22% with many having a good neurological outcome. Prognosis is typically assessed 72 hours or more after cardiac arrest. Rates of survival are better in those who someone saw collapse, got bystander CPR, or had either ventricular tachycardia or ventricular fibrillation when assessed. Survival among those with Vfib or Vtach is 15 to 23%. Women are more likely to survive cardiac arrest and leave hospital than men. A 1997 review found rates of survival to discharge of 14% although different studies varied from 0 to 28%. In those over the age of 70 who have a cardiac arrest while in hospital, survival to hospital discharge is less than 20%. How well these individuals are able to manage after leaving hospital is not clear. A study of survival rates from out-of-hospital cardiac arrest found that 14.6% of those who had received resuscitation by paramedics survived as far as admission to hospital. Of these, 59% died during admission, half of these within the first 24 hours, while 46% survived until discharge from hospital. This reflects an overall survival following cardiac arrest of 6.8%. Of these 89% had normal brain function or mild neurological disability, 8.5% had moderate impairment, and 2% had major neurological disability. Of those who were discharged from hospital, 70% were still alive four years later. Based on death certificates, sudden cardiac death accounts for about 15% of all deaths in Western countries. In the United States 326,000 cases of out of hospital and 209,000 cases of in hospital cardiac arrest occur among adults a year. The lifetime risk is three times greater in men (12.3%) than women (4.2%) based on analysis of the Framingham Heart Study. However this gender difference disappeared beyond 85 years of age. In the United States during pregnancy cardiac arrest occurs in about one in twelve thousand deliveries or 1.8 per 10,000 live births. Rates are lower in Canada. In many publications the stated or implicit meaning of "sudden cardiac death" is sudden death from cardiac causes. However, sometimes physicians call cardiac arrest "sudden cardiac death" even if the person survives. Thus one can hear mentions of "prior episodes of sudden cardiac death" in a living person. In 2006 the American Heart Association presented the following definitions of sudden cardiac arrest and sudden cardiac death: "Cardiac arrest is the sudden cessation of cardiac activity so that the victim becomes unresponsive, with no normal breathing and no signs of circulation. If corrective measures are not taken rapidly, this condition progresses to sudden death. Cardiac arrest should be used to signify an event as described above, that is reversed, usually by CPR and/or defibrillation or cardioversion, or cardiac pacing. Sudden cardiac death should not be used to describe events that are not fatal". In some medical facilities, the resuscitation team may purposely respond slowly to a person in cardiac arrest, a practice known as "slow code", or may fake the response altogether for the sake of the person's family, a practice known as "show code". This is generally done for people for whom performing CPR will have no medical benefit. Such practices are ethically controversial, and are banned in some jurisdictions. ^ a b c d e Field, John M. (2009). The Textbook of Emergency Cardiovascular Care and CPR. Lippincott Williams & Wilkins. p. 11. ISBN 9780781788991. Archived from the original on 2017-09-05. ^ a b c "What Are the Signs and Symptoms of Sudden Cardiac Arrest?". NHLBI. June 22, 2016. Archived from the original on 27 August 2016. Retrieved 16 August 2016. ^ a b c "Who Is at Risk for Sudden Cardiac Arrest?". NHLBI. June 22, 2016. Archived from the original on 23 August 2016. Retrieved 16 August 2016. ^ a b c d e f "What Causes Sudden Cardiac Arrest?". NHLBI. June 22, 2016. Archived from the original on 28 July 2016. Retrieved 16 August 2016. ^ a b c "How Can Death Due to Sudden Cardiac Arrest Be Prevented?". NHLBI. June 22, 2016. Archived from the original on 27 August 2016. Retrieved 16 August 2016. ^ a b "How Is Sudden Cardiac Arrest Treated?". NHLBI. June 22, 2016. Archived from the original on 27 August 2016. Retrieved 16 August 2016. ^ a b c d Adams, James G. (2012). Emergency Medicine: Clinical Essentials (Expert Consult – Online). Elsevier Health Sciences. p. 1771. ISBN 978-1455733941. Archived from the original on 2017-09-05. ^ a b c d e f Kronick, SL; Kurz, MC; Lin, S; Edelson, DP; Berg, RA; Billi, JE; Cabanas, JG; Cone, DC; Diercks, DB; Foster, JJ; Meeks, RA; Travers, AH; Welsford, M (3 November 2015). "Part 4: Systems of Care and Continuous Quality Improvement: 2015 American Heart Association Guidelines Update for Cardiopulmonary Resuscitation and Emergency Cardiovascular Care". Circulation. 132 (18 Suppl 2): S397–413. doi:10.1161/cir.0000000000000258. PMID 26472992. ^ a b c "What Is Sudden Cardiac Arrest?". NHLBI. June 22, 2016. Archived from the original on 28 July 2016. Retrieved 16 August 2016. ^ Schenone, AL; Cohen, A; Patarroyo, G; Harper, L; Wang, X; Shishehbor, MH; Menon, V; Duggal, A (10 August 2016). "Therapeutic hypothermia after cardiac arrest: a systematic review/meta-analysis exploring the impact of expanded criteria and targeted temperature". Resuscitation. 108: 102–110. doi:10.1016/j.resuscitation.2016.07.238. PMID 27521472. ^ a b Arrich, Jasmin; Holzer, Michael; Havel, Christof; Müllner, Marcus; Herkner, Harald (2016-02-15). "Hypothermia for neuroprotection in adults after cardiopulmonary resuscitation". The Cochrane Database of Systematic Reviews. 2: CD004128. doi:10.1002/14651858.CD004128.pub4. ISSN 1469-493X. PMID 26878327. ^ a b Myerburg, Robert J., ed. (2015). "Cardiac Arrest and Sudden Cardiac Death". Braunwald's heart disease : a textbook of cardiovascular medicine. Mann, Douglas L.,, Zipes, Douglas P.,, Libby, Peter,, Bonow, Robert O.,, Braunwald, Eugene. (Tenth ed.). Philadelphia, PA: Saunders. pp. 821–860. ISBN 9781455751341. OCLC 890409638. ^ "What Are the Signs and Symptoms of Sudden Cardiac Arrest?". National Heart, Lung and Blood Institute. 1 April 2011. Archived from the original on 21 June 2015. Retrieved 2015-06-21. ^ Parnia, S; Spearpoint, K; Fenwick, PB (August 2007). "Near death experiences, cognitive function and psychological outcomes of surviving cardiac arrest". Resuscitation. 74 (2): 215–21. doi:10.1016/j.resuscitation.2007.01.020. PMID 17416449. ^ "Mount Sinai – Cardiac arrest". Archived from the original on 2012-05-15. ^ a b c Podrid, Philip J (2016-08-22). "Pathophysiology and etiology of sudden cardiac arrest". www.uptodate.com. Retrieved 2017-12-03. ^ Zipes, Douglas P.; Camm, A. John; Borggrefe, Martin; Buxton, Alfred E.; Chaitman, Bernard; Fromer, Martin; Gregoratos, Gabriel; Klein, George; Moss, Arthur J. (2006-09-05). "ACC/AHA/ESC 2006 Guidelines for Management of Patients With Ventricular Arrhythmias and the Prevention of Sudden Cardiac Death: a report of the American College of Cardiology/American Heart Association Task Force and the European Society of Cardiology Committee for Practice Guidelines (writing committee to develop Guidelines for Management of Patients With Ventricular Arrhythmias and the Prevention of Sudden Cardiac Death): developed in collaboration with the European Heart Rhythm Association and the Heart Rhythm Society". Circulation. 114 (10): e385–484. doi:10.1161/CIRCULATIONAHA.106.178233. ISSN 1524-4539. PMID 16935995. ^ a b c Centers for Disease Control and Prevention (CDC) (2002-02-15). "State-specific mortality from sudden cardiac death--United States, 1999". MMWR. Morbidity and Mortality Weekly Report. 51 (6): 123–126. ISSN 0149-2195. PMID 11898927. ^ a b c Zheng, Z. J.; Croft, J. B.; Giles, W. H.; Mensah, G. A. (2001-10-30). "Sudden cardiac death in the United States, 1989 to 1998". Circulation. 104 (18): 2158–2163. doi:10.1161/hc4301.098254. ISSN 1524-4539. PMID 11684624. ^ Fuster, Valentin; Topol, Eric J.; Nabel, Elizabeth G. (2005). Atherothrombosis and Coronary Artery Disease. Lippincott Williams & Wilkins. ISBN 9780781735834. Archived from the original on 2016-06-03. ^ Zheng ZJ, Croft JB, Giles WH, Mensah GA (October 2001). "Sudden cardiac death in the United States, 1989 to 1998". Circulation. 104 (18): 2158–63. doi:10.1161/hc4301.098254. PMID 11684624. ^ a b Kannel WB, Wilson PW, D'Agostino RB, Cobb J (August 1998). "Sudden coronary death in women". Am. Heart J. 136 (2): 205–12. doi:10.1053/hj.1998.v136.90226. PMID 9704680. ^ Stevens, Steven M.; Reinier, Kyndaron; Chugh, Sumeet S. (2013). "Increased Left Ventricular Mass as a Predictor of Sudden Cardiac Death Is it Time to Put it to The Test?". Circulation: Arrhythmia and Electrophysiology. 6 (1): 212–217. doi:10.1161/CIRCEP.112.974931. ISSN 1941-3149. PMC 3596001. PMID 23424223. Archived from the original on 2015-08-06. ^ Katholi RE, Couri DM (2011). "Left Ventricular Hypertrophy: Major Risk Factor in Patients with Hypertension: Update and Practical Clinical Applications". Int J Hypertens. 2011: 495349. doi:10.4061/2011/495349. PMC 3132610. PMID 21755036. ^ Chugh, S. S.; Kelly, K. L.; Titus, J. L. (2000-08-08). "Sudden cardiac death with apparently normal heart". Circulation. 102 (6): 649–654. doi:10.1161/01.cir.102.6.649. ISSN 1524-4539. PMID 10931805. ^ "Survivors of out-of-hospital cardiac arrest with apparently normal heart. Need for definition and standardized clinical evaluation. Consensus Statement of the Joint Steering Committees of the Unexplained Cardiac Arrest Registry of Europe and of the Idiopathic Ventricular Fibrillation Registry of the United States". Circulation. 95 (1): 265–272. 1997-01-07. doi:10.1161/01.cir.95.1.265. ISSN 0009-7322. PMID 8994445. ^ a b Drory, Y.; Turetz, Y.; Hiss, Y.; Lev, B.; Fisman, E. Z.; Pines, A.; Kramer, M. R. (1991-11-15). "Sudden unexpected death in persons less than 40 years of age". The American Journal of Cardiology. 68 (13): 1388–1392. doi:10.1016/0002-9149(91)90251-f. ISSN 0002-9149. PMID 1951130. ^ Kuisma, M.; Alaspää, A. (July 1997). "Out-of-hospital cardiac arrests of non-cardiac origin. Epidemiology and outcome". European Heart Journal. 18 (7): 1122–1128. doi:10.1093/oxfordjournals.eurheartj.a015407. ISSN 0195-668X. PMID 9243146. ^ Kuisma M, Alaspää A (July 1997). "Out-of-hospital cardiac arrests of non-cardiac origin. Epidemiology and outcome". Eur. Heart J. 18 (7): 1122–8. doi:10.1093/oxfordjournals.eurheartj.a015407. PMID 9243146. ^ "Resuscitation Council (UK) Guidelines 2005". Archived from the original on 2009-12-15. ^ ECC Committee, Subcommittees and Task Forces of the American Heart Association (December 2005). "2005 American Heart Association Guidelines for Cardiopulmonary Resuscitation and Emergency Cardiovascular Care". Circulation. 112 (24 Suppl): IV1–203. doi:10.1161/CIRCULATIONAHA.105.166550. PMID 16314375. ^ Friedlander Y, Siscovick DS, Weinmann S, et al. (January 1998). "Family history as a risk factor for primary cardiac arrest". Circulation. 97 (2): 155–60. doi:10.1161/01.cir.97.2.155. PMID 9445167. ^ Myerburg, Robert J; Castellanos, Agustin (2014). "327. Cardiovascular Collapse, Cardiac Arrest, and Sudden Cardiac Death". Harrison's principles of internal medicine. Kasper, Dennis L.,, Fauci, Anthony S., Hauser, Stephen L.,, Longo, Dan L. (Dan Louis), Jameson, J. Larry,, Loscalzo, Joseph (19th ed.). New York: McGraw-Hill. ISBN 9780071802154. OCLC 893557976. ^ Goldenberg, Ilan; Jonas, Michael; Tenenbaum, Alexander; Boyko, Valentina; Matetzky, Shlomi; Shotan, Avraham; Behar, Solomon; Reicher-Reiss, Henrietta; Bezafibrate Infarction Prevention Study Group (2003-10-27). "Current smoking, smoking cessation, and the risk of sudden cardiac death in patients with coronary artery disease". Archives of Internal Medicine. 163 (19): 2301–2305. doi:10.1001/archinte.163.19.2301. ISSN 0003-9926. PMID 14581249. ^ Rubart, Michael; Zipes, Douglas P. (2005). "Mechanisms of sudden cardiac death". Journal of Clinical Investigation. 115 (9): 2305–2315. doi:10.1172/JCI26381. ISSN 0021-9738. PMC 1193893. PMID 16138184. ^ Bunch, T. Jared; Hohnloser, Stefan H.; Gersh, Bernard J. (2007). "Mechanisms of Sudden Cardiac Death in Myocardial Infarction Survivors Insights From the Randomized Trials of Implantable Cardioverter-Defibrillators". Circulation. 115 (18): 2451–2457. doi:10.1161/CIRCULATIONAHA.106.683235. ISSN 0009-7322. PMID 17485594. Archived from the original on 2016-08-01. ^ "Types of Arrhythmia". National Heart, Lung and Blood Institute. 1 April 2011. Archived from the original on 7 June 2015. Retrieved 2015-06-21. ^ Ochoa FJ, Ramalle-Gómara E, Carpintero JM, García A, Saralegui I (June 1998). "Competence of health professionals to check the carotid pulse". Resuscitation. 37 (3): 173–5. doi:10.1016/S0300-9572(98)00055-0. PMID 9715777. ^ Bahr J, Klingler H, Panzer W, Rode H, Kettler D (August 1997). "Skills of lay people in checking the carotid pulse". Resuscitation. 35 (1): 23–6. doi:10.1016/S0300-9572(96)01092-1. PMID 9259056. ^ a b c d ECC Committee, Subcommittees and Task Forces of the American Heart Association (December 2005). "2005 American Heart Association Guidelines for Cardiopulmonary Resuscitation and Emergency Cardiovascular Care". Circulation. 112 (24 Suppl): IV1–203. doi:10.1161/CIRCULATIONAHA.105.166550. PMID 16314375. ^ a b c d e f "Resuscitation Council (UK) Guidelines 2005". Archived from the original on 2009-12-15. ^ Taverny, G; Mimouni, Y; LeDigarcher, A; Chevalier, P; Thijs, L; Wright, JM; Gueyffier, F (10 March 2016). "Antihypertensive pharmacotherapy for prevention of sudden cardiac death in hypertensive individuals". The Cochrane Database of Systematic Reviews. 3: CD011745. doi:10.1002/14651858.CD011745.pub2. PMID 26961575. ^ Kause J, Smith G, Prytherch D, Parr M, Flabouris A, Hillman K (September 2004). "A comparison of antecedents to cardiac arrests, deaths and emergency intensive care admissions in Australia and New Zealand, and the United Kingdom—the ACADEMIA study". Resuscitation. 62 (3): 275–82. doi:10.1016/j.resuscitation.2004.05.016. PMID 15325446. ^ a b c Members, Writing Committee; Epstein, Andrew E.; DiMarco, John P.; Ellenbogen, Kenneth A.; Estes, N. A. Mark; Freedman, Roger A.; Gettes, Leonard S.; Gillinov, A. Marc; Gregoratos, Gabriel (2008-05-27). "ACC/AHA/HRS 2008 Guidelines for Device-Based Therapy of Cardiac Rhythm Abnormalities: A Report of the American College of Cardiology/American Heart Association Task Force on Practice Guidelines (Writing Committee to Revise the ACC/AHA/NASPE 2002 Guideline Update for Implantation of Cardiac Pacemakers and Antiarrhythmia Devices): Developed in Collaboration With the American Association for Thoracic Surgery and Society of Thoracic Surgeons". Circulation. 117 (21): e350–e408. doi:10.1161/CIRCUALTIONAHA.108.189742. ISSN 0009-7322. PMID 18483207. ^ a b Shun-Shin, Matthew J.; Zheng, Sean L.; Cole, Graham D.; Howard, James P.; Whinnett, Zachary I.; Francis, Darrel P. (2017-06-07). "Implantable cardioverter defibrillators for primary prevention of death in left ventricular dysfunction with and without ischaemic heart disease: a meta-analysis of 8567 patients in the 11 trials". European Heart Journal. 38 (22): 1738–1746. doi:10.1093/eurheartj/ehx028. ISSN 0195-668X. PMC 5461475. PMID 28329280. ^ Connolly, S. J.; Hallstrom, A. P.; Cappato, R.; Schron, E. B.; Kuck, K. H.; Zipes, D. P.; Greene, H. L.; Boczor, S.; Domanski, M. (December 2000). "Meta-analysis of the implantable cardioverter defibrillator secondary prevention trials. AVID, CASH and CIDS studies. Antiarrhythmics vs Implantable Defibrillator study. Cardiac Arrest Study Hamburg . Canadian Implantable Defibrillator Study". European Heart Journal. 21 (24): 2071–2078. doi:10.1053/euhj.2000.2476. ISSN 0195-668X. PMID 11102258. ^ Neil K. Kaneshiro (2 August 2011). "Omega-3 fatty acids". MedlinePlus Medical Encyclopedia. Archived from the original on 21 June 2015. Retrieved 2015-06-21. ^ Evangelos C. Rizos; Evangelia E. Ntzani; Eftychia Bika; Michael S. Kostapanos; Moses S. Elisaf (September 2012). "Association Between Omega-3 Fatty Acid Supplementation and Risk of Major Cardiovascular Disease Events A Systematic Review and Meta-analysis". JAMA. 308 (10): 1024–1033. doi:10.1001/2012.jama.11374. PMID 22968891. ^ American Heart, Association (May 2006). "2005 American Heart Association (AHA) guidelines for cardiopulmonary resuscitation (CPR) and emergency cardiovascular care (ECC) of pediatric and neonatal patients: pediatric advanced life support". Pediatrics. 117 (5): e1005–28. doi:10.1542/peds.2006-0346. PMID 16651281. ^ a b Mutchner L (January 2007). "The ABCs of CPR--again". Am J Nurs. 107 (1): 60–9, quiz 69–70. doi:10.1097/00000446-200701000-00024. PMID 17200636. ^ a b Resuscitation Council (UK). "Pre-hospital cardiac arrest" (PDF). www.resus.org.uk. p. 41. Archived (PDF) from the original on 13 May 2015. Retrieved 3 September 2014. ^ Resuscitation Council (UK) (5 September 2012). "Comments on the duration of CPR following the publication of 'Duration of resuscitation efforts and survival after in-hospital cardiac arrest: an observational study' Goldberger ZD et al. Lancet". Archived from the original on 28 June 2014. Retrieved 3 September 2014. ^ a b c d e f g h Neumar, RW; Shuster, M; Callaway, CW; Gent, LM; Atkins, DL; Bhanji, F; Brooks, SC; de Caen, AR; Donnino, MW; Ferrer, JM; Kleinman, ME; Kronick, SL; Lavonas, EJ; Link, MS; Mancini, ME; Morrison, LJ; O'Connor, RE; Samson, RA; Schexnayder, SM; Singletary, EM; Sinz, EH; Travers, AH; Wyckoff, MH; Hazinski, MF (3 November 2015). "Part 1: Executive Summary: 2015 American Heart Association Guidelines Update for Cardiopulmonary Resuscitation and Emergency Cardiovascular Care". Circulation. 132 (18 Suppl 2): S315–67. doi:10.1161/cir.0000000000000252. PMID 26472989. ^ White, Leigh; Melhuish, Thomas; Holyoak, Rhys; Ryan, Thomas; Kempton, Hannah; Vlok, Ruan (September 2018). "Advanced airway management in out of hospital cardiac arrest: A systematic review and meta-analysis". The American Journal of Emergency Medicine. 36 (12): 2298–2306. doi:10.1016/j.ajem.2018.09.045. PMID 30293843. ^ Studnek JR, Thestrup L, Vandeventer S, et al. (September 2010). "The association between prehospital endotracheal intubation attempts and survival to hospital discharge among out-of-hospital cardiac arrest patients". Acad Emerg Med. 17 (9): 918–25. doi:10.1111/j.1553-2712.2010.00827.x. PMID 20836771. ^ White, L; Melhuish, T; Holyoak, R; Ryan, T; Kempton, H; Vlok, R (December 2018). "Advanced airway management in out of hospital cardiac arrest: A systematic review and meta-analysis". The American Journal of Emergency Medicine. 36 (12): 2298–2306. doi:10.1016/j.ajem.2018.09.045. PMID 30293843. ^ a b Zhan, L; Yang, LJ; Huang, Y; He, Q; Liu, GJ (27 March 2017). "Continuous chest compression versus interrupted chest compression for cardiopulmonary resuscitation of non-asphyxial out-of-hospital cardiac arrest". The Cochrane Database of Systematic Reviews. 3: CD010134. doi:10.1002/14651858.CD010134.pub2. PMID 28349529. ^ Huang, Y; He, Q; Yang, LJ; Liu, GJ; Jones, A (Sep 12, 2014). "Cardiopulmonary resuscitation (CPR) plus delayed defibrillation versus immediate defibrillation for out-of-hospital cardiac arrest". The Cochrane Database of Systematic Reviews. 9 (9): CD009803. doi:10.1002/14651858.CD009803.pub2. PMID 25212112. ^ a b c d e f g Lavonas, EJ; Drennan, IR; Gabrielli, A; Heffner, AC; Hoyte, CO; Orkin, AM; Sawyer, KN; Donnino, MW (3 November 2015). "Part 10: Special Circumstances of Resuscitation: 2015 American Heart Association Guidelines Update for Cardiopulmonary Resuscitation and Emergency Cardiovascular Care". Circulation. 132 (18 Suppl 2): S501–18. doi:10.1161/cir.0000000000000264. PMID 26472998. ^ a b c de Caen, AR; Berg, MD; Chameides, L; Gooden, CK; Hickey, RW; Scott, HF; Sutton, RM; Tijssen, JA; Topjian, A; van der Jagt, ÉW; Schexnayder, SM; Samson, RA (3 November 2015). "Part 12: Pediatric Advanced Life Support: 2015 American Heart Association Guidelines Update for Cardiopulmonary Resuscitation and Emergency Cardiovascular Care". Circulation. 132 (18 Suppl 2): S526–42. doi:10.1161/cir.0000000000000266. PMC 6191296. PMID 26473000. ^ Lyon R.M; Cobbe S.M. ; Bradley J.M. ; Grubb N.R. ; et al. (2004). "Surviving out of hospital cardiac arrest at home: a postcode lottery?". Emergency Medicine Journal. 21 (5): 619–624. doi:10.1136/emj.2003.010363. PMC 1726412. PMID 15333549. ^ Olasveengen TM, Sunde K, Brunborg C, Thowsen J, Steen PA, Wik L (November 2009). "Intravenous drug administration during out-of-hospital cardiac arrest: a randomized trial". JAMA. 302 (20): 2222–9. doi:10.1001/jama.2009.1729. PMID 19934423. ^ Lin, S; Callaway, CW; Shah, PS; Wagner, JD; Beyene, J; Ziegler, CP; Morrison, LJ (Mar 15, 2014). "Adrenaline for out-of-hospital cardiac arrest resuscitation: A systematic review and meta-analysis of randomized controlled trials". Resuscitation. 85 (6): 732–40. doi:10.1016/j.resuscitation.2014.03.008. PMID 24642404. ^ Laina, A; Karlis, G; Liakos, A; Georgiopoulos, G; Oikonomou, D; Kouskouni, E; Chalkias, A; Xanthos, T (9 July 2016). "Amiodarone and cardiac arrest: Systematic review and meta-analysis". International Journal of Cardiology. 221: 780–788. doi:10.1016/j.ijcard.2016.07.138. PMID 27434349. ^ McLeod, SL; Brignardello-Petersen, R; Worster, A; You, J; Iansavichene, A; Guyatt, G; Cheskes, S (14 October 2017). "Comparative effectiveness of antiarrhythmics for out-of-hospital cardiac arrest: A systematic review and network meta-analysis". Resuscitation. 121: 90–97. doi:10.1016/j.resuscitation.2017.10.012. PMID 29037886. ^ Ali, MU; Fitzpatrick-Lewis, D; Kenny, M; Raina, P; Atkins, DL; Soar, J; Nolan, J; Ristagno, G; Sherifali, D (November 2018). "Effectiveness of antiarrhythmic drugs for shockable cardiac arrest: A systematic review". Resuscitation. 132: 63–72. doi:10.1016/j.resuscitation.2018.08.025. PMID 30179691. ^ Belletti, A; Benedetto, U; Putzu, A; Martino, EA; Biondi-Zoccai, G; Angelini, GD; Zangrillo, A; Landoni, G (May 2018). "Vasopressors During Cardiopulmonary Resuscitation. A Network Meta-Analysis of Randomized Trials". Critical Care Medicine. 46 (5): e443–e451. doi:10.1097/CCM.0000000000003049. PMID 29652719. ^ Morley, PT (June 2011). "Drugs during cardiopulmonary resuscitation". Current Opinion in Critical Care. 17 (3): 214–8. doi:10.1097/MCC.0b013e3283467ee0. PMID 21499094. ^ Attaran, RR; Ewy, GA (July 2010). "Epinephrine in resuscitation: curse or cure?". Future Cardiology. 6 (4): 473–82. doi:10.2217/fca.10.24. PMID 20608820. ^ Velissaris, D; Karamouzos, V; Pierrakos, C; Koniari, I; Apostolopoulou, C; Karanikolas, M (April 2016). "Use of Sodium Bicarbonate in Cardiac Arrest: Current Guidelines and Literature Review". Journal of Clinical Medicine Research. 8 (4): 277–83. doi:10.14740/jocmr2456w. PMC 4780490. PMID 26985247. ^ Neumar, RW; Otto, CW; Link, MS; Kronick, SL; Shuster, M; Callaway, CW; Kudenchuk, PJ; Ornato, JP; McNally, B; Silvers, SM; Passman, RS; White, RD; Hess, EP; Tang, W; Davis, D; Sinz, E; Morrison, LJ (Nov 2, 2010). "Part 8: adult advanced cardiovascular life support: 2010 American Heart Association Guidelines for Cardiopulmonary Resuscitation and Emergency Cardiovascular Care". Circulation. 122 (18 Suppl 3): S729–67. doi:10.1161/CIRCULATIONAHA.110.970988. PMID 20956224. ^ Sanfilippo, F; Corredor, C; Santonocito, C; Panarello, G; Arcadipane, A; Ristagno, G; Pellis, T (October 2016). "Amiodarone or lidocaine for cardiac arrest: A systematic review and meta-analysis". Resuscitation. 107: 31–7. doi:10.1016/j.resuscitation.2016.07.235. PMID 27496262. ^ Perrott, J; Henneberry, RJ; Zed, PJ (December 2010). "Thrombolytics for cardiac arrest: case report and systematic review of controlled trials". Annals of Pharmacotherapy. 44 (12): 2007–13. doi:10.1345/aph.1P364. PMID 21119096. ^ a b Schenone, Aldo L.; Cohen, Aaron; Patarroyo, Gabriel; Harper, Logan; Wang, XiaoFeng; Shishehbor, Mehdi H.; Menon, Venu; Duggal, Abhijit (November 2016). "Therapeutic hypothermia after cardiac arrest: A systematic review/meta-analysis exploring the impact of expanded criteria and targeted temperature". Resuscitation. 108: 102–110. doi:10.1016/j.resuscitation.2016.07.238. ISSN 1873-1570. PMID 27521472. ^ Neumar, RW; Shuster, M; Callaway, CW; Gent, LM; Atkins, DL; Bhanji, F; Brooks, SC; de Caen, AR; Donnino, MW; Ferrer, JM; Kleinman, ME; Kronick, SL; Lavonas, EJ; Link, MS; Mancini, ME; Morrison, LJ; O'Connor, RE; Samson, RA; Schexnayder, SM; Singletary, EM; Sinz, EH; Travers, AH; Wyckoff, MH; Hazinski, MF (3 November 2015). "Part 1: Executive Summary: 2015 American Heart Association Guidelines Update for Cardiopulmonary Resuscitation and Emergency Cardiovascular Care". Circulation. 132 (18 Suppl 2): S315–67. doi:10.1161/cir.0000000000000252. PMID 26472989. ^ Therapeutic hypothermia after cardiac arrest : clinical application and management. Lundbye, Justin B. London: Springer. 2012. ISBN 9781447129509. OCLC 802346256. ^ Loertscher, L; Reed, DA; Bannon, MP; Mueller, PS (January 2010). "Cardiopulmonary resuscitation and do-not-resuscitate orders: a guide for clinicians". The American Journal of Medicine. 123 (1): 4–9. doi:10.1016/j.amjmed.2009.05.029. PMID 20102982. ^ Knox, C; Vereb, JA (December 2005). "Allow natural death: a more humane approach to discussing end-of-life directives". Journal of Emergency Nursing. 31 (6): 560–1. doi:10.1016/j.jen.2005.06.020. PMID 16308044. ^ Millin, MG; Comer, AC; Nable, JV; Johnston, PV; Lawner, BJ; Woltman, N; Levy, MJ; Seaman, KG; Hirshon, JM (15 September 2016). "Patients without ST elevation after return of spontaneous circulation may benefit from emergent percutaneous intervention: A systematic review and meta-analysis". Resuscitation. 108: 54–60. doi:10.1016/j.resuscitation.2016.09.004. PMID 27640933. ^ Lehot, JJ; Long-Him-Nam, N; Bastien, O (December 2011). "[Extracorporeal life support for treating cardiac arrest]". Bulletin de l'Académie Nationale de Médecine. 195 (9): 2025–33, discussion 2033–6. PMID 22930866. ^ Camuglia, AC. ; Randhawa, VK. ; Lavi, S.; Walters, DL. (Sep 2014). "Cardiac catheterization is associated with superior outcomes for survivors of out of hospital cardiac arrest: Review and meta-analysis". Resuscitation. 85 (11): 1533–1540. doi:10.1016/j.resuscitation.2014.08.025. PMID 25195073. ^ Cave, DM; Gazmuri, RJ; Otto, CW; Nadkarni, VM; Cheng, A; Brooks, SC; Daya, M; Sutton, RM; Branson, R; Hazinski, MF (2010-11-02). "Part 7: CPR techniques and devices: 2010 American Heart Association Guidelines for Cardiopulmonary Resuscitation and Emergency Cardiovascular Care". Circulation. 122 (18 Suppl 3): S720–8. doi:10.1161/CIRCULATIONAHA.110.970970. PMC 3741663. PMID 20956223. ^ Benjamin, Emelia J.; Blaha, Michael J.; Chiuve, Stephanie E.; Cushman, Mary; Das, Sandeep R.; Deo, Rajat; de Ferranti, Sarah D.; Floyd, James; Fornage, Myriam (2017-03-07). "Heart Disease and Stroke Statistics-2017 Update: A Report From the American Heart Association". Circulation. 135 (10): e146–e603. doi:10.1161/CIR.0000000000000485. ISSN 1524-4539. PMC 5408160. PMID 28122885. ^ Kusumoto, Fred M.; Bailey, Kent R.; Chaouki, Ahmad Sami; Deshmukh, Abhishek J.; Gautam, Sandeep; Kim, Robert J.; Kramer, Daniel B.; Lambrakos, Litsa K.; Nasser, Naseer H. (2017-01-01). "Systematic Review for the 2017 AHA/ACC/HRS Guideline for Management of Patients With Ventricular Arrhythmias and the Prevention of Sudden Cardiac Death: A Report of the American College of Cardiology/American Heart Association Task Force on Clinical Practice Guidelines and the Heart Rhythm Society". Circulation. 138 (13): e392–e414. doi:10.1161/CIR.0000000000000550. ISSN 0009-7322. PMID 29084732. ^ Medicine, Institute of (2015-06-30). Strategies to Improve Cardiac Arrest Survival: A Time to Act. doi:10.17226/21723. ISBN 9780309371995. PMID 26225413. ^ Jollis, James G.; Granger, Christopher B. (2016-12-20). "Improving Care of Out-of-Hospital Cardiac Arrest: Next Steps". Circulation. 134 (25): 2040–2042. doi:10.1161/CIRCULATIONAHA.116.025818. ISSN 0009-7322. PMID 27994023. ^ Daya, Mohamud R.; Schmicker, Robert H.; May, Susanne; Morrison, Laurie J. (2015). "Current burden of cardiac arrest in the United States: report from the Resuscitation Outcomes Consortium. Paper commissioned by the Committee on the Treatment of Cardiac Arrest: Current Status and Future Directions" (PDF). ^ de Caen, AR; Berg, MD; Chameides, L; Gooden, CK; Hickey, RW; Scott, HF; Sutton, RM; Tijssen, JA; Topjian, A; van der Jagt, ÉW; Schexnayder, SM; Samson, RA (3 November 2015). "Part 12: Pediatric Advanced Life Support: 2015 American Heart Association Guidelines Update for Cardiopulmonary Resuscitation and Emergency Cardiovascular Care". Circulation. 132 (18 Suppl 2): S526–42. doi:10.1161/cir.0000000000000266. PMC 6191296. PMID 26473000. ^ Kronick, SL; Kurz, MC; Lin, S; Edelson, DP; Berg, RA; Billi, JE; Cabanas, JG; Cone, DC; Diercks, DB; Foster, JJ; Meeks, RA; Travers, AH; Welsford, M (3 November 2015). "Part 4: Systems of Care and Continuous Quality Improvement: 2015 American Heart Association Guidelines Update for Cardiopulmonary Resuscitation and Emergency Cardiovascular Care". Circulation. 132 (18 Suppl 2): S397–413. doi:10.1161/cir.0000000000000258. PMID 26472992. ^ a b Sasson, C; Rogers, MA; Dahl, J; Kellermann, AL (January 2010). "Predictors of survival from out-of-hospital cardiac arrest: a systematic review and meta-analysis". Circulation: Cardiovascular Quality and Outcomes. 3 (1): 63–81. doi:10.1161/circoutcomes.109.889576. PMID 20123673. ^ Bougouin, W; Mustafic, H; Marijon, E; Murad, MH; Dumas, F; Barbouttis, A; Jabre, P; Beganton, F; Empana, JP; Celermajer, DS; Cariou, A; Jouven, X (September 2015). "Gender and survival after sudden cardiac arrest: A systematic review and meta-analysis". Resuscitation. 94: 55–60. doi:10.1016/j.resuscitation.2015.06.018. PMID 26143159. ^ Ballew KA (May 1997). "Cardiopulmonary resuscitation". BMJ. 314 (7092): 1462–5. doi:10.1136/bmj.314.7092.1462. PMC 2126720. PMID 9167565. ^ a b van Gijn, MS; Frijns, D; van de Glind, EM; C van Munster, B; Hamaker, ME (Jul 2014). "The chance of survival and the functional outcome after in-hospital cardiopulmonary resuscitation in older people: a systematic review". Age and Ageing. 43 (4): 456–63. doi:10.1093/ageing/afu035. PMID 24760957. ^ Cobbe SM, Dalziel K, Ford I, Marsden AK (June 1996). "Survival of 1476 patients initially resuscitated from out of hospital cardiac arrest". BMJ. 312 (7047): 1633–7. doi:10.1136/bmj.312.7047.1633. PMC 2351362. PMID 8664715. ^ a b Zheng ZJ, Croft JB, Giles WH, Mensah GA (October 2001). "Sudden cardiac death in the United States, 1989 to 1998". Circulation. 104 (18): 2158–63. doi:10.1161/hc4301.098254. PMID 11684624. ^ "Abstract 969: Lifetime Risk for Sudden Cardiac Death at Selected Index Ages and by Risk Factor Strata and Race: Cardiovascular Lifetime Risk Pooling Project – Lloyd-Jones et al. 120 (10018): S416 – Circulation". Archived from the original on 2011-06-08. ^ Porter, I; Vacek, J (2008), "Single ventricle with persistent truncus arteriosus as two rare entities in an adult patient: a case report", J Med Case Reports, 2: 184, doi:10.1186/1752-1947-2-184, PMC 2424060, PMID 18513397. ^ Buxton, Alfred E.; Calkins, Hugh; Callans, David J.; DiMarco, John P.; Fisher, John D.; Greene, H. Leon; Haines, David E.; Hayes, David L.; Heidenreich, Paul A. (2006-12-05). "ACC/AHA/HRS 2006 key data elements and definitions for electrophysiological studies and procedures: a report of the American College of Cardiology/American Heart Association Task Force on Clinical Data Standards (ACC/AHA/HRS Writing Committee to Develop Data Standards on Electrophysiology)". Journal of the American College of Cardiology. 48 (11): 2360–2396. doi:10.1016/j.jacc.2006.09.020. ISSN 1558-3597. PMID 17161282. ^ "Slow Codes, Show Codes and Death". The New York Times. The New York Times Company. 22 August 1987. Archived from the original on 18 May 2013. Retrieved 2013-04-06. ^ "Decision-making for the End of Life". Physician Advisory Service. College of Physicians and Surgeons of Ontario. May 2006. Archived from the original on 2013-05-09. Retrieved 2013-04-06. ^ DePalma, Judith A.; Miller, Scott; Ozanich, Evelyn; Yancich, Lynne M. (November 1999). "Slow" Code: Perspectives of a Physician and Critical Care Nurse. Critical Care Nursing Quarterly. 22. Lippincott Williams and Wilkins. pp. 89–99. ISSN 1550-5111. Archived from the original on 2013-03-28. This page was last edited on 13 April 2019, at 09:24 (UTC).